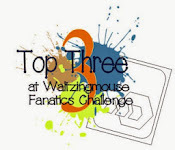 Claire at Waltzingmouse Stamps has had a lovely idea for a blog hop and challenge - the Flower Show. Several well known designers and bloggers have made guest projects focusing on WMS florals for a lovely spring display. The challenge bit? Just CASE one of the projects and hook it up to the WMS blog tomorrow. I couldn't decide between two projects so I've actually made something for each of them and I thought I'd blog the first one today in case anybody who reads my blog hasn't seen the WMS Flower Show and would like to join in before Claire posts tomorrow. I loved this project my Emilie Chamel, showcased in her blog post here. I got this set recently and hadn' got round to inking it up yet so I decided this was a good push in the right direction! I should probably say that I'm possibly the world's worst CASEer - it usually all goes to pot when I try to base my work on somebody else's! I had fun having a go, though. 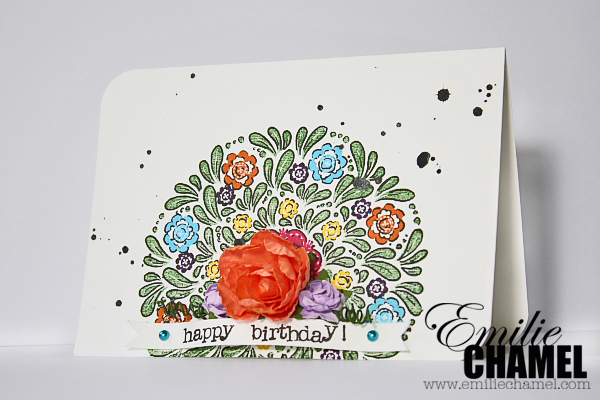 For my version, I kept Emilie's technique (black pen outlines for a hand-drawn look), placement off the edge of the card and the colour scheme. 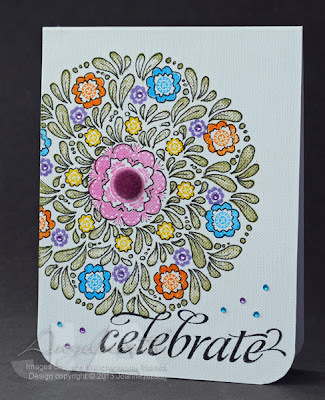 I changed the orientation, used a different sentiment and slimmed down the embellishments for an easier-to-post version of the card - I used a velvet brad and some nail art gems in the centres of the purple flowers. Instead of Emilie's ink splatters I've used a scattering of tiny gemstones in colours to match two of the inks in the medallion. This is a fun set with lots of different elements that you can build up in different ways, I'm sure it will get more outings soon! Thanks for stopping by - do check out the Flower Show for some floral goodness and maybe join in the fun if you're inspired along the way (there are prizes, too!). Very William Morris - I like! Not sure what casing is but I love your card Joanne and the inspiration one too. Wonderful! I do like the sprinkle of gems around the sentiment. 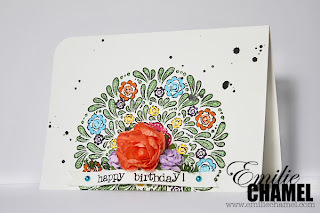 I love the effect of using the black pen around the stamped image. Great card! It is a lovely card Joanna. I find CASEing difficult too so using the original card for inspiration is a good call. Fab stamp set too! The black outline you drew makes the color even brighter - looks like stained glass! Beautiful! This is gorgeous Joanne! The black outlining really makes the flowers pop and the gems are so pretty too! I cant believe you made one for each! You did a beautiful job here with love the black outline. This is so pretty. I love your take on the cards. Joanne, your card looks fantastic!! Love the added blings and the beautiful colours of the folk art medallion. Great case!! THIS is gorgeous!! Love the colors and CASE of the black pen inking!! Fabulous placement of the sentiment!! Simply stunning! Love the festive look of your card. Loving the colors you used and you did an amazing job CASEing this card. The more I see the folk art medallion set, the more I have to have it. 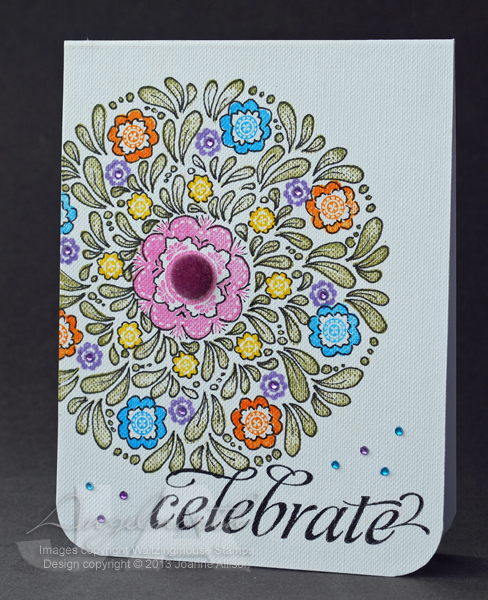 Such pretty coloring on the folk art medallion! Such an eyecatcher. You've done that stamp set well! Lovely colours and the outlining really makes it pop! Very cool card! Love your coloring.